One Momma Saving Money: Flunked: Fairy Tale Reform School out on paperback + a #Giveaway! Flunked: Fairy Tale Reform School out on paperback + a #Giveaway! Would you send a villain to do a hero’s job? Flunked is an exciting new twisted fairy tale from the award-winning author of the Secrets of My Hollywood Life series. Gilly wouldn’t call herself wicked, exactly…but when you have five little brothers and sisters and live in a run-down boot, you have to get creative to make ends meet. Gilly’s a pretty good thief (if she does say so herself). Gilly’s sentenced to three months at Fairy Tale Reform School where all of the teachers are former (super-scary) villains like the Big Bad Wolf, the Evil Queen, and Cinderella’s Wicked Stepmother. Harsh. But when she meets fellow students Jax and Kayla, she learns there’s more to this school than its heroic mission. There’s a battle brewing and Gilly has to wonder: can a villain really change? Purchase Flunked (Fairy Tale Reform School) on Amazon for $6.99 & FREE Shipping on orders over $35. 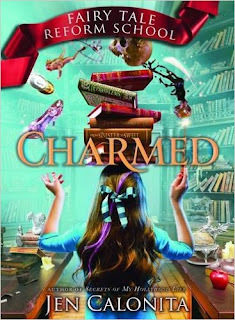 Charmed is the exciting sequel to the wildly popular Flunked -- second in the brand new Fairy Tale Reform School series where the teachers are (former) villains. "Charming fairy-tale fun." -Sarah Mlynowski, author of the New York Times bestselling Whatever After series. Pre-order Charmed (Fairy Tale Reform School) on Amazon for $11.64 & FREE Shipping on orders over $35. My daughter's review of Flunked: Fairy Tale Reform School! My daughter is in 4th grade and loved this book. It was so creative and was a twist on the normal “fairy tale” books. This story is told form the point of view of Gilly. Gilly comes from a poor family and it is a struggle to even eat at times. Gilly turns to stealing in order to help her family. After she is caught stealing for the third time, she is required to attend the Fairy Tale Reform school . Gilly must spend her time at the school transforming from “villain” into a hero. While most would think of this as a punishment, it was a real change for Gilly. She now has more opportunities then she did before. While at the school, Gilly comes to realize not everything is as it seems. She devises a plan to figure out what is going on all while trying to be a good even though at times she doesn’t feel like it. Gilly’s family is counting on her. This is a cute book and my daughter is anxiously awaiting the release of the sequel!